"Top Secret" emails have been found from a private account used by Hillary Clinton during her reign as US Secretary of State. This strongly suggests that Clinton has gone much further in breaking the law than "merely" using a personal email account for State business. We've seen in the past that when transiting Jupiter forms an aspect with natal Pallas, a native's ethics can become a public matter. This is not a bad thing if we've been behaving ourselves (though discordant aspects may present us with ethical challenges as well). It's particularly gratifying when the transit happens to a mainstream (also known as "evil") politician because it can mean some of their evil going public. 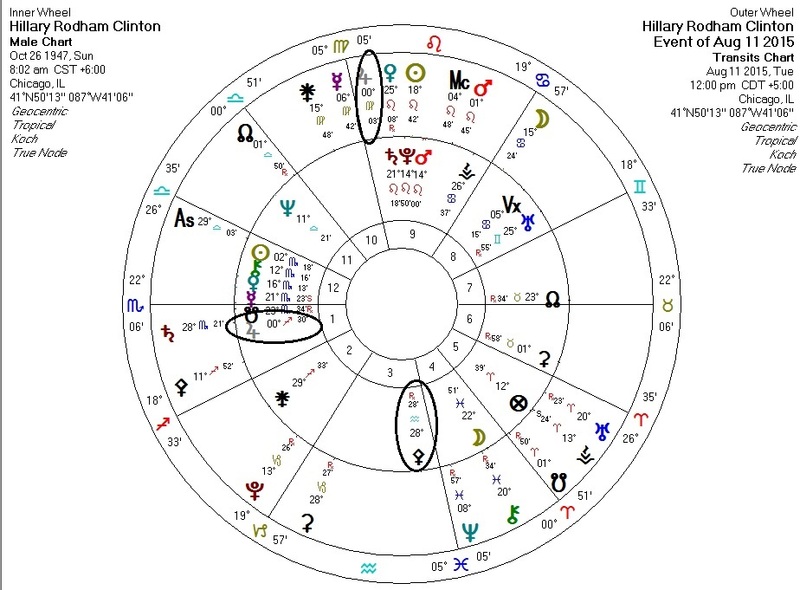 So you may note on the transit chart below that transiting Jupiter is square Clinton's Jupiter and opposite her Pallas. It would not surprise me to see Hillary weasel her way out of this. Transiting Jupiter will be at her MC soon. And, frankly, history tells us that American "democracy" smiles upon wrongdoing and criminality.